The two journalists had worked on Reuters coverage of acrisis in the western state of Rakhine, where an estimated 655,000 Rohingya Muslims have fled from a fierce military crackdown on militants. 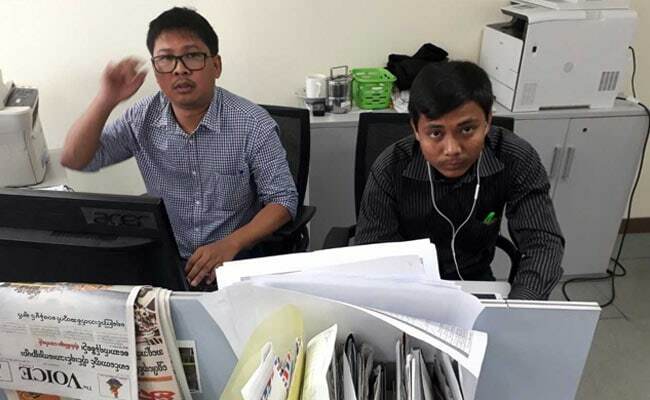 Yangon, Myanmar: Family members of two Reuters reporters detained in Myanmar said on Thursday the pair had told them they were arrested almost immediately after being handed some documents by policemen they had gone to meet. Wa Lone, 31, and Kyaw Soe Oo, 27, were arrested on Dec. 12 on suspicion of violating the country's Official Secrets Act. The Ministry of Information has cited the police as saying they were "arrested for possessing important and secret government documents related to Rakhine State and security forces". In the first account of the circumstances of the arrests from the journalists themselves, Wa Lone's wife, Pan Ei Mon, told a news conference her husband said that he and Kyaw Soe Oo had a meeting at a restaurant on Dec. 12 with two police officers they had not met before. The policemen handed them two rolled-up papers and said they could take the documents home and open them there, Pan Ei Mon said, quoting her husband. "They took the two rolled papers and paid the bill and went out from the restaurant," she said. "They were immediately grabbed by around seven or eight policemen who handcuffed them and arrested them. He told me that." Nyo Nyo Aye, Kyaw Soe Oo's sister, told the news conference that her brother had given her a similar account of the incident. On Wednesday, Lieutenant Colonel Myint Htwe, a senior staff officer from the Yangon Police Division, said: "We took action because they committed the crime. It needs to be solved in court." The government has said that two policemen were arrested along with the two journalists, but has not given any information since on what has happened to them. It was not clear whether the two policemen arrested were the same two men the reporters met. Wa Lone and Kyaw Soe Oo were remanded for a second two-week period in custody by a court on Wednesday and sent to Yangon's Insein prison. During the court hearing, they were allowed to meet their families and a lawyer for the first time since being arrested. The families and lawyer Than Zaw Aung, who has been retained by Reuters, were also allowed to meet the journalists for about half an hour at the prison on Thursday. Than Zaw Aung said at the news conference that the two journalists told him they were being held in the same block as prisoners facing murder and drugs charges, and were afraid to leave their cells. On Wednesday, the reporters said they had not been mistreated in custody. "The situation is okay," Wa Lone said. "We will face it the best we can because we have never done anything wrong. We have never violated the media law nor ethics." The British colonial-era Official Secrets Act carries a maximum prison sentence of 14 years. Government officials from some of the world's major nations, including the United States, Britain and Canada, as well as top U.N. officials, have previously called for the release of the two journalists. Several NGOs and journalist organisations have called the arrests an attack on the freedom of the press. On Wednesday, a Reuters spokesperson reiterated demands that the journalists be freed. "These two journalists are being held for simply doing their jobs and have done nothing wrong. 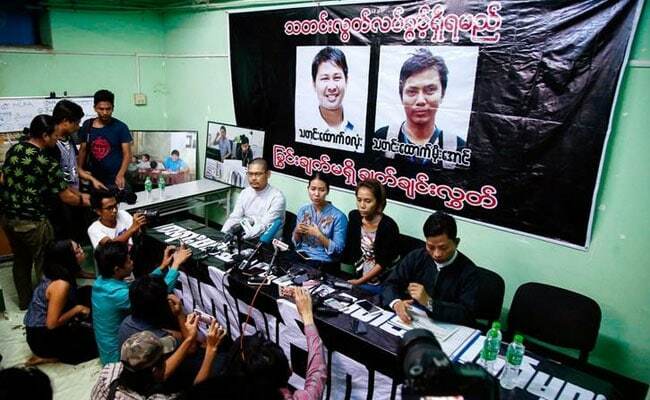 It is time for Wa Lone and Kyaw Soe Oo to be released," the spokesperson said.